A true mountain cabin with beautiful wood trim and ceilings inside create a warm, comforting atmosphere. 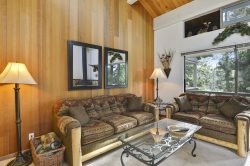 The main level of this beautiful home features a full country kitchen and spacious living room with an inviting fireplace to keep warm on cool Tahoe evenings and enjoy the flat screen TV for late night movies. From the living room you will step out onto the back deck where you can soak up the summer sunshine while cooking lunch or dinner on the gas grill. Also on the ground floor is a full bath with tub/shower and a bedroom with king size bed. Upstairs there are two additional bedrooms, one with a queen size bed and the other with a king as well as a shared bath with a shower. Note - the ceiling upstairs slopes.down with the roof line. Not a lot of head room there. During the summer months you will have access to the Tahoe Park HOA Amenities, which include: 3 1/2 acres of Private Beach, Manicured Park with 850 feet of lakefront footage, 2 Piers, Beach Volleyball, Playground and Swing Set, Basketball and Bocce Ball, Picnic and BBQ area, and Horseshoe Pits! This area is meticulously maintained, and a perfect setting to enjoy the lake. This home is a only a short distance from the delicious Sunnyside Restaurant and Fire Sign Cafe, and about 1.5 miles to Tahoe City. Please be considerate, the is a smoke and pet free home. Tahoe House was awesome. We did try the xplorie app for the kayak rental but the place it sent us to was not very helpful or willing to try it, so we ended up paying elsewhere.